News and information about Sutter Amador Hospital located in Jackson, CA. Jackson – The American Legion Ambulance Service (ALA) has become the first in California to complete the Critical Care Emergency Medical Transport Program to improve the quality of care for critically ill patients. Members from the American Legion Ambulance and Sutter Amador Hospital gather in front of the ALA’s new bariatric ambulance. The critical care transport program teaches paramedics specialized patient care in areas including cardiac and pediatric care to treat critically ill patients that need to be transferred from one facility to another. A critically ill patient needs a higher level of ambulance transport service that previously required a nurse or medical staff member to ride along. With the new certifications, American Legion Ambulance (ALA) paramedics can transport critical patients directly to a care facility without delays. Sutter Amador Hospital accepted a generous $228,000 donation from the American Legion Ambulance Service to help support the hospital’s Emergency Department. Al Lennox, president of the American Legion Post 108 Ambulance Services (ALA) and Alan McNany, vice president of the ALA, presented the check to hospital CEO Anne Platt, physicians and staff of the ED. Al Lennox, who is involved in ambulance services for the past 30 years, said the collaboration and care that Sutter Amador provides is essential to Amador County, and is one the organization is proud to support. 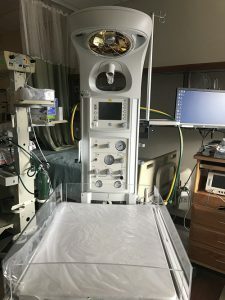 As SAH’s ED is the sole community provider for Amador County, the donation will be used to purchase several pieces of equipment, portable cardiac monitors and wheelchairs for ED patients. The funding will also allow the Emergency Department team to complete cardiac stress testes directly in the ED. The Sutter Amador ED sees approximately 80 patients per day. 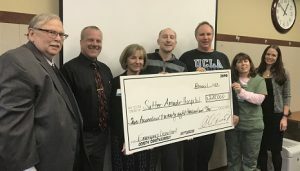 JACKSON – Sutter Amador Hospital presented checks to five local community partners on Feb. 1 during the Community Advisory Council meeting at the hospital. Anne Platt, Sutter Amador Hospital CEO, presents Linda Zender, Operation Care board member with a donation. Operation Care, Amador Tuolumne Community Action Agency (ATCAA), Amador County Fair Foundation, Amador STARS and the Interfaith Food Bank all received a donation from the hospital to help support local programs and initiatives.